How many states is too many? 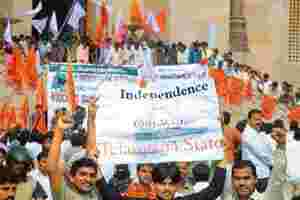 There is little doubt that the Telangana movement has opened up a range of possibilities for remaking the entire map of India. In 1956, close on the heels of the creation of a Telugu majority state, and in accordance with the recommendations of the first States Reorganisation Commission, Jawaharlal Nehru set about to create states on a linguistic basis. The idea stood the test of time, and over half of our 28 states are organized on such lines. Yet, the impending break-up of Andhra Pradesh does open up larger questions. How many is too many? If the process does get started all over, it is unclear where it will end. And it is critical to bear in mind that maps do change over time. In 1937, at the time of the first elections to provincial assemblies, there were 11 provinces in British India. Even among them, Bengal, Bihar, Orissa and Assam had earlier in the 20th century been one unit. The divisions after Independence were not all on the lines of language. Some states were formed in response to local regional demands. Himachal Pradesh was to give the hill peoples of erstwhile Punjab a place in the sun. In the plains region of the same larger state, the linguistic principle was applied, with a Punjabi-and a Hindi-speaking state being created during Indira Gandhi’s time. The example bears some careful consideration. Few will dispute that the economic growth of Haryana over the last four decades has been facilitated greatly by its attainment of statehood. Gujarat is another case in point. When it celebrates 50 years of its founding next July, it will showcase its economic achievements since separation from the bilingual Bombay state. Indeed, political cohesion and administrative efficiency are powerful arguments in favour of smaller states. The 2009 National Health and Family Welfare survey (based on 2004-05 data) gives an insight into this vis-à-vis two of our populous states, Uttar Pradesh and Bihar. Both have reported better performance on child mortality since they were carved up. This is evident at a meta level in politics as well. Both Mayawati and Nitish Kumar seem to see governance, especially better law and order, as central in a manner their predecessors did not. But the evidence, to be fair, is mixed. The chronic political instability of Jharkhand can only partly be blamed on fractured verdicts from the voters. The small size of the legislature makes the politics of defection much easier. Size also constrains the ability of states to deal with insurgency, and Maoism continues to plague Jharkhand more acutely now than before. The promised share of development for the state’s scheduled tribes has not materialized, and the failure of statesmanship is borne by the people at large. Natural resource endowment is no guarantee of economic performance. Jharkhand languishes while the neighbouring Chhattisgarh has done better. This is especially so in regard to rice production and the public food distribution system, both important in a mostly rural society. Still, it is important to note that boundaries can and do change. On the whole, India has been able to achieve such changes with little bloodshed. Few, however, recall how firmly the Congress opposed the idea of language-based statehood for the Marathis and the Gujaratis. To this day the name of chief minister Morarji Desai is unpopular among Marathi speakers for the iron hand with which he put down popular protests in the city then called Bombay. There is no magic number or formula to settle the question. But it is true that many Indian states are too populous to be cohesive. Uttar Pradesh alone has at least 170 million people. Smaller states carved out in the heartland will at least bring government closer to the people, making it easier to hold legislators and officials accountable. It will also make under-class groups more crucial in terms of electoral clout. In the case of Telangana, the only major movement in Andhra Pradesh in favour of a division is led by key Dalit figures. The break-up of the larger entity will hobble the power of strong landed groups who more or less run the polity. A similar calculus may well underlie Mayawati’s enthusiasm for the division of Uttar Pradesh. What this means for governance hinges less on the size of states and more on the tissue of administration that eventually connects the daily life of citizens to government. Yet, this hardly figures in the debate today. Leafing through the debates on the pros and cons of reorganization in the 1950s, one is struck by the deep concern about its spin-off in terms of economic growth. The creation of the artifices of growth, after all, unified leaders of the new nation, irrespective of political affiliation. Whether the new states would be able to execute large projects and retain the newfound momentum for growth was a major concern for Nehru and his colleagues. Redrawing maps ought to enhance and not retard economic performance or social progress. That concern remains valid, and needs continuing attention.